Barrow was the agent for DMG in South West France. 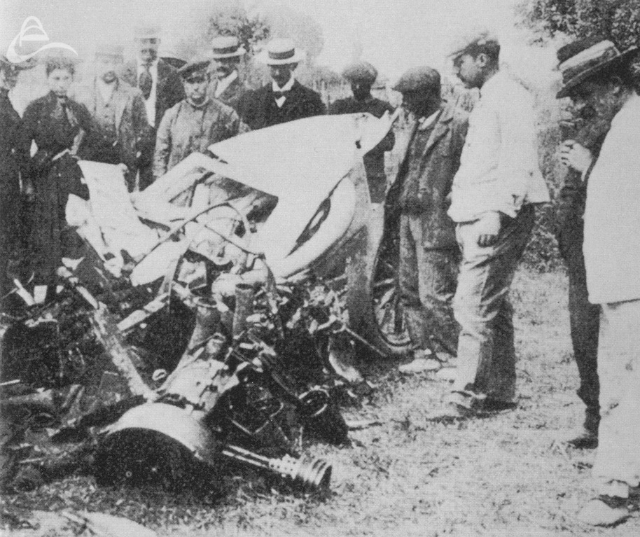 He started racing in 1900 and in 1903 drove a De Dietrich in the fatal Paris to Madrid race in 1903. He contracted pneumonia brought on from his injuries sustained when he crashed in the race and died a few days later. <span class="name">Claude Loraine Barrow was born at Sydnope Hall, near Matlock, Derbyshire, on the l0th August, 1870. His mother, Janetta Hannah Barrow (nee Loraine), the sister of Sir Lambton Loraine (11th Baronet), tragically died just 18 days after Claude was born. His aunt, Lady Fairbairn helped with his upbringing and when his father died in 1876 before Claude was 6, he ended up being entirely brought up in the Fairbairn household. He attended Jesus College, Cambridge and in 1894 and 1895 he was part of a scientific expedition surveying the Alps in New Zealand. He moved to the south-west of France, taking up residence in the the villa La Romana in Biarritz. He converted to the Roman Catholic faith in 1896 and the following year on January 17th, he married Valerie Marie Gurdon of Assington Hall, Norfolk. He made his racing debut on February 25th 1900, entering a 12 hp Panhard in the Circuit du Sud Ouest and finishing 9th. He also drove a Panhard to 6th place in the Bordeaux-Perigueux-Bordeaux race on June 3rd and 4th that year. That race was won by 'Levegh' (Alfred Velghe) driving a Mors. Claude was friends with Emil Jellinek and, through that friendship, in 1901 he became the agent for Daimler-Motoren-Gesellschaft in south-west France. He also took to racing their cars, gaining the distinction of being the first person to race a Mercedes in competition when he drove in the Circuit du Sud-Ouest in Pau on 17th February 1901. The car had a number of mechanical difficulties leading up to the race so it was no great surprise when Claude's race ended after just 300 metres. The reverse gear had failed to lock out and accidentally engaged destroying the gearbox. His next race was more successful, finishing 5th in the heavy class in the Nice-Salon-Nice trial. He chose to race a De Dietrich in 1902 competing in the Paris-Vienna Trail and the Circuit des Ardennes without any notable results. For 1903 he commissioned a 60 HP Panhard from Harry J. Lawson. Lawson was a motor industry pioneer and a bit of a fraudster who was sentenced to one year’s hard labor the following year. For what ever reason the Panhard never arrived and thus Claude entered a 45 hp De Dietrich again for the 1903 Paris-Madrid race. The were the 5th car away from the start at the Bassin des Suisses de Versailles. Claude was not well and the car had been difficult to start. He and his Spanish riding mechanic, Pierre Rodez, had been up since two in the morning. They eventually got it going and made the start on time however in a race marred by a number of fatalities to drivers, mechanics and spectators, he crashed towards the end of the first stage. The accident happened in the village of Arveyres, near Libourne, when Claude, who heading flat out along the straight section of the Port du Noyer just after it crosses the Dordogne when he hit a dog. With the dog was caught in the front axle, Claude lost control and crashed in a tree. the force was so great that the front spring hanger became embedded in the tree all the way back to the frame. The engine was torn out and Rodez, who was perched precariously on the running board, was killed instantly when he was thrown from the car. Claude was taken to hospital in Libourne where his leg had to be amputated. He remained in a critical condition until pneumonia set in he succumbed to his injuries 20 days after the crash. It was reported that a cyclist who was repairing his bicycle by the tree was also killed. The race was cancelled after that first stage and the cars were impounded, towed by horses to the nearest station and returned to Paris on specially charted trains. Claude is buried with Rodez in the Sabaou cemetery in Biarritz.